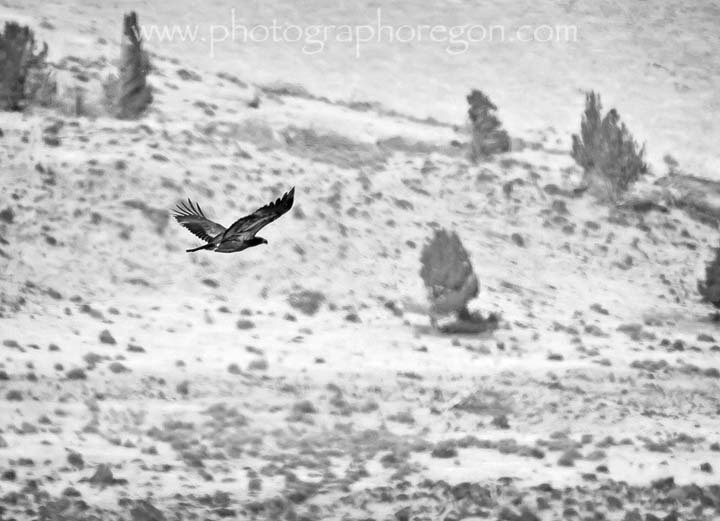 Animals are not the first that come to mind when thinking about a black and white image. We love their colors. The more colorful the better but their form is so much more obvious when taken to monochrome. 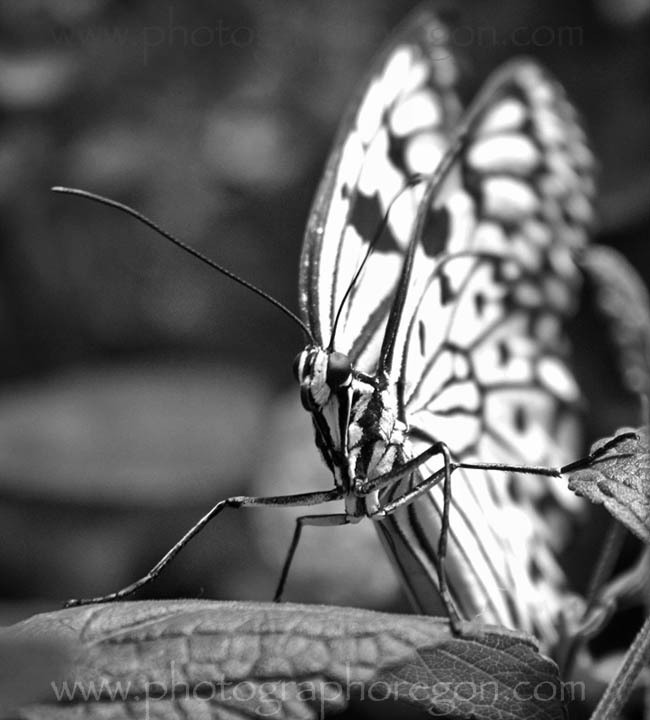 The above butterfly is actually black and white to begin with. In it’s color image the background of brilliant flowers sets it apart. Fortunately, for our purposes here it is a highly contrasting creature. 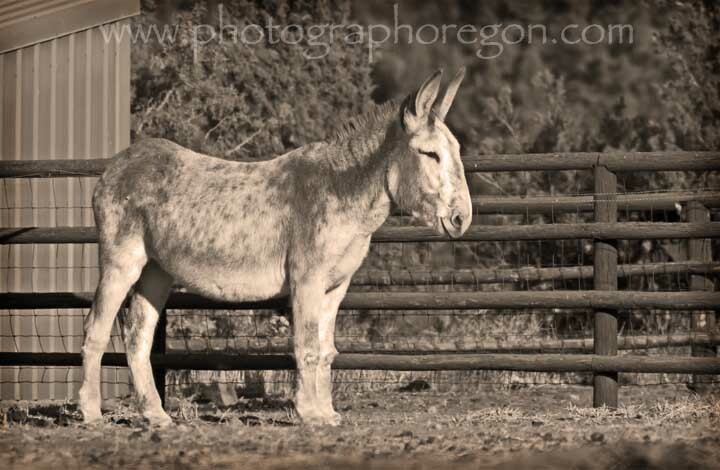 For me, somehow donkeys usually end up in sepia. Sepia is an old fashioned form of monochrome that is more of a brown color. Made from the sepia cuttlefish, sepia pigment was originally used to treat B&W photographs. Prints treated with sepia were designed to last longer. During the developing of the print, sepia pigment would be added it turned any remaining silver in the print into a sulfide. A lot of photographs done in the 1700s were treated with sepia during the development process. They are a telltale brown color, which is a little softer looking. These days sepia is a color filter used as a treatment to give images an older look. I have to feel it to apply it. Donkeys bring it out in me! You’ll also see it again in the structures page. Birds tend to capture my eye more often with contrast suitable for monochrome. 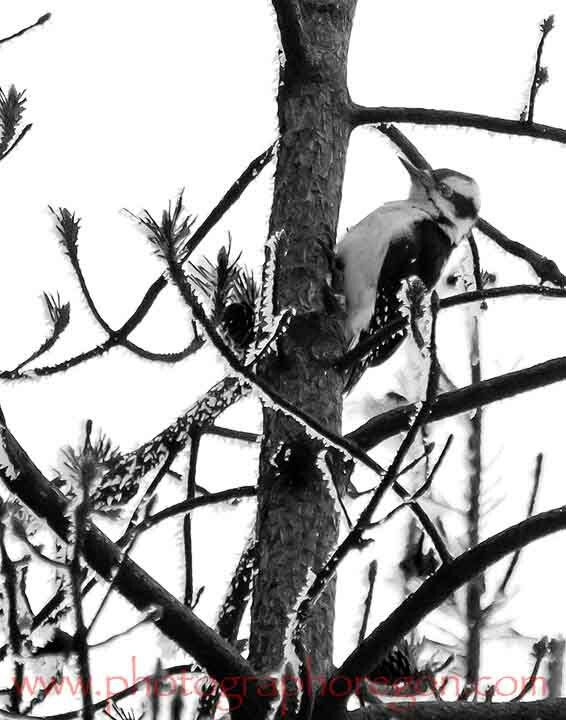 This woodpecker is a hairy woodpecker female. She is monochrome to start with, (the males having a red stripe on the nape of their necks) and was foraging in a burned tree there was almost no color to remove. I came out a lot cleaner and brighter by converting it. This Harrier Hawk is one of those occasions where a backdrop of a sandy hills at Summer Lake give enough contrast to set off the bird. Had it moved further into the trees it would not have worked. Waterfowl are often on…well, water. Water makes a great contrast during certain times of the day, or under the right seasonal conditions, like flat cloudy gray skies. 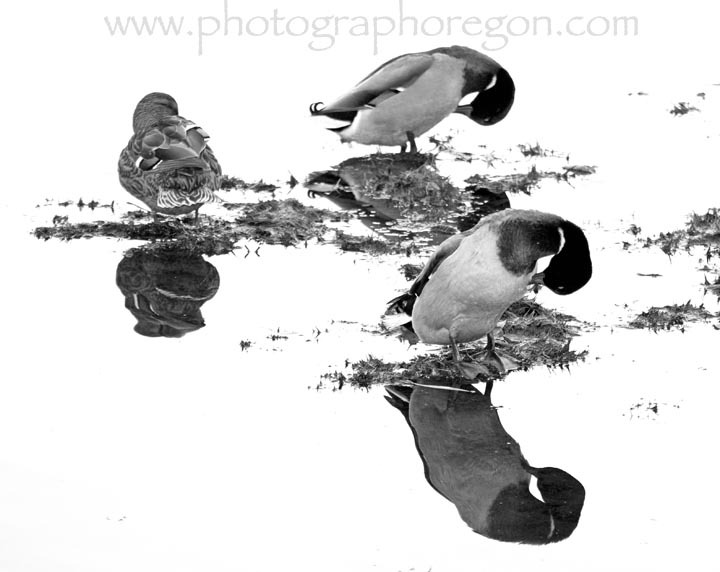 These mallards hanging out in Mirror Pond really stand out. 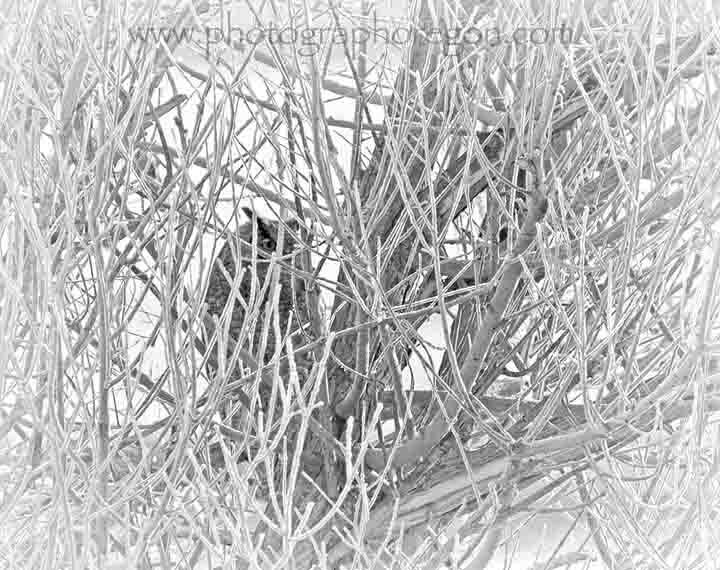 This Great Horned Owl also in Summer Lake works well in sepia or B&W. His contrasting face pops right out of the tree he was hanging out in. 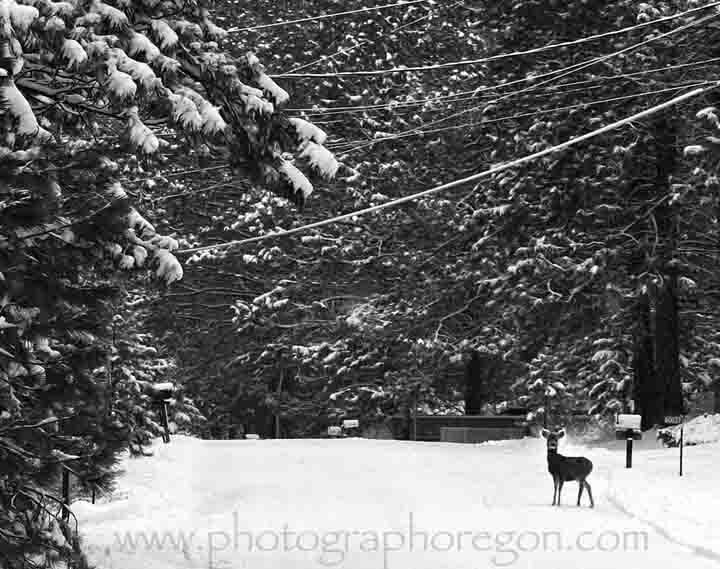 Lastly, winter snow contrasts animals that the rest of the year, blend in with the landscape. It’s a fine time to catch up with them and play. This little girl was hanging out in my neighborhood. You can read on many other pages that this is not an uncommon occurrence.